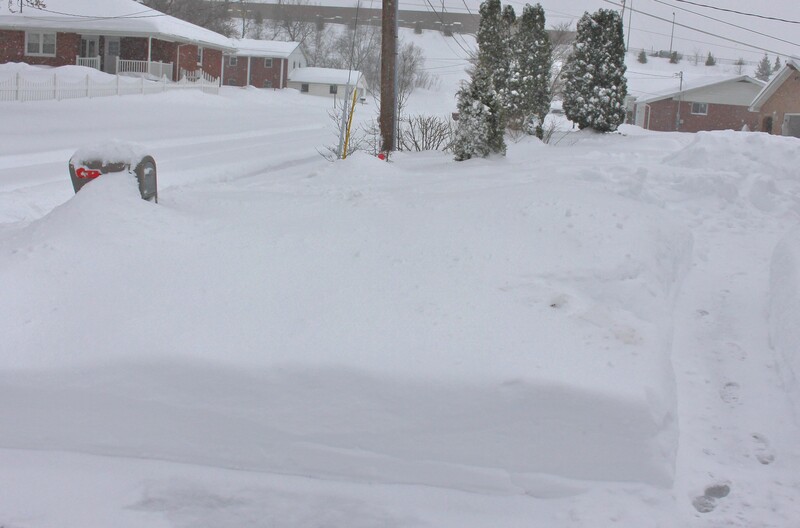 It appears this garden and most of the East Coast are still going over one more speedbump on the road to spring. 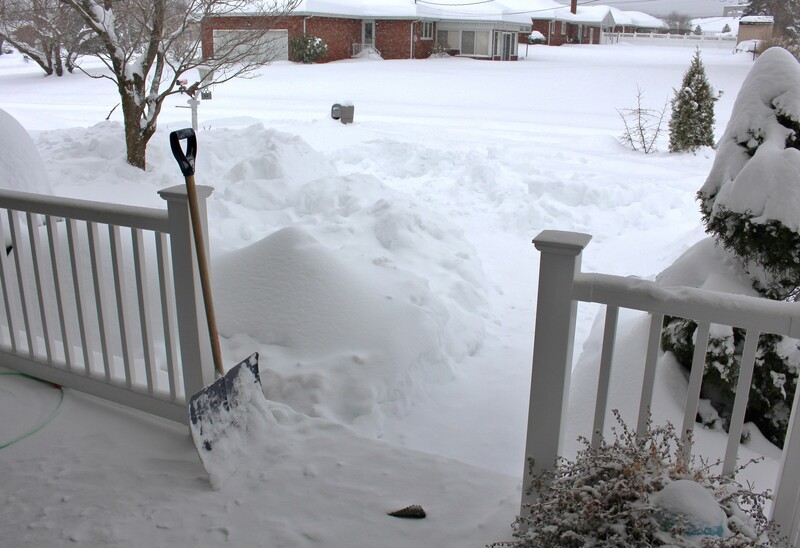 Today we welcomed a little over two feet of snow into the garden, and I suspect it will be a bit before (a) the kids return to school, and (b) I need to fertilize the lawn. Some might say 2017 has been off to a rough start, and they might be right, but I’m going to try and think about other things such as Cathy’s Tuesday View and consider the border along the street as my entry for this year. Posting every week might be a stretch, but maybe showing this view once every other week will be do-able. We’ll see. Two feet of March snow is excellent fort building material and the front yard is a battleground of trenches and tunnels… plus buried snowdrops and crocus. Right now the view doesn’t really matter though. People are still digging out and cars and trucks are being pulled out (as our evening walk down to the main street demonstrated) and we just have to deal with that first. 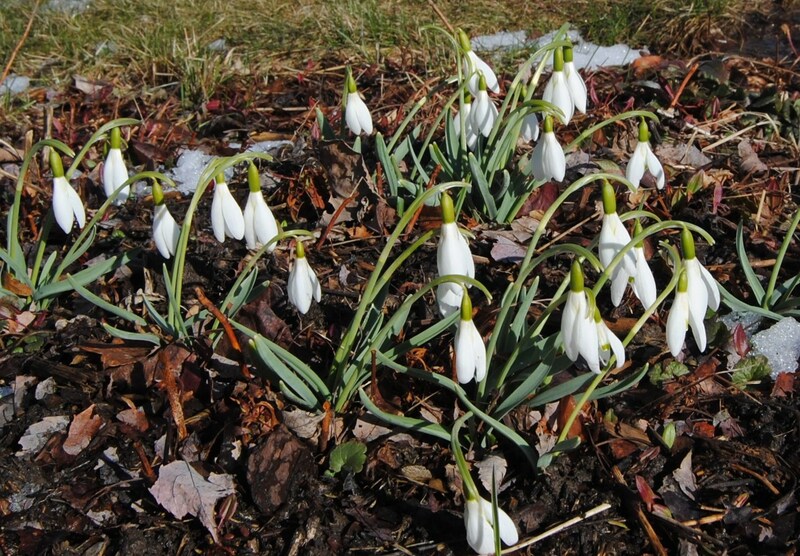 The forecast ahead is cold, but the sun when it comes out will be strong, and hopefully there’s something left to look forward to when all this snow melts… since the snowdrops have already given up on spring. I made a point of getting the lawn mowed Saturday. I wanted to have things nice and neat for when the snow comes. 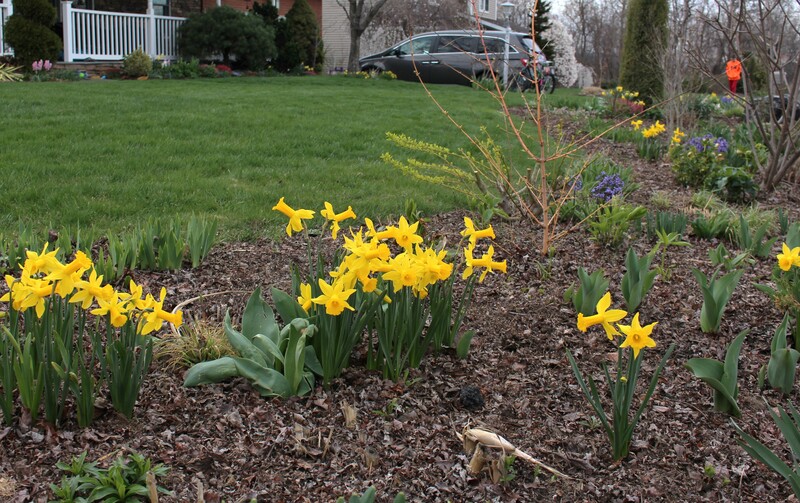 Bright yellow daffodils, blue hyacinths and a freshly cut lawn. 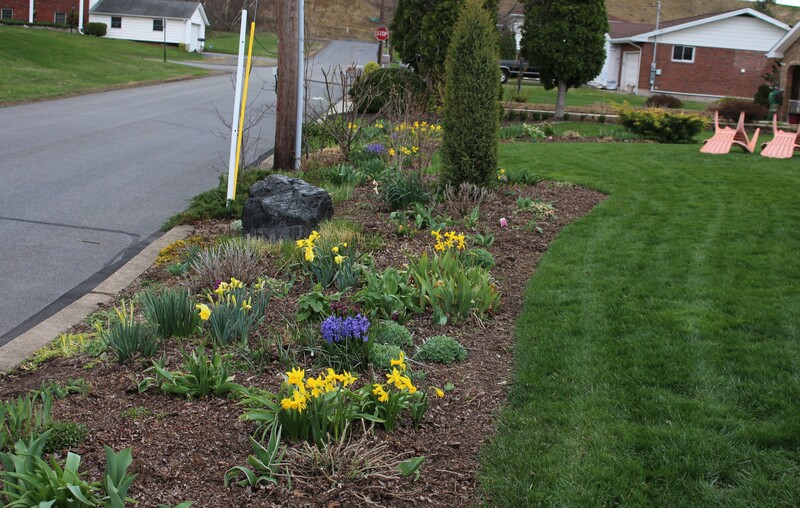 The front border is looking very spring-ish with its mix of sprouting perennials and flowering spring bulbs. Please ignore the upended chairs which the nasty wind has blown over. Although things are way too early this year, all my efforts to convince them to slow down have gone unheeded. The plants just don’t know what to do with this rollercoaster ride of highs and lows and as a result it’s been a kind of crappy spring with snowdrops peaking and then wilting in a few days of heat, hailstorms knocking everything down, cold weather keeping the depressing wreckage at a standstill, another warm spell to snap things back into high speed, and then now this latest arctic blast. 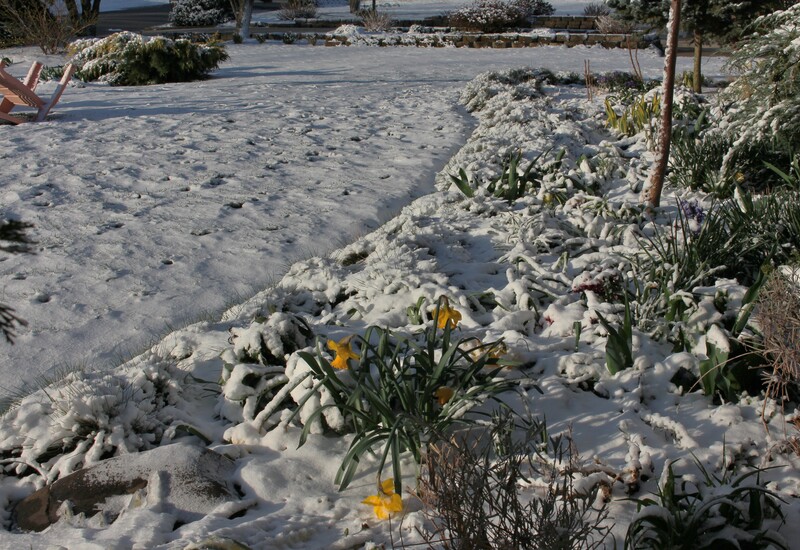 Here’s the front border six days prior when only a few weather beaten crocus were up. At least I had enough time to raid the neighborhood dump and mulch the border with plenty of nicely chopped leaves. 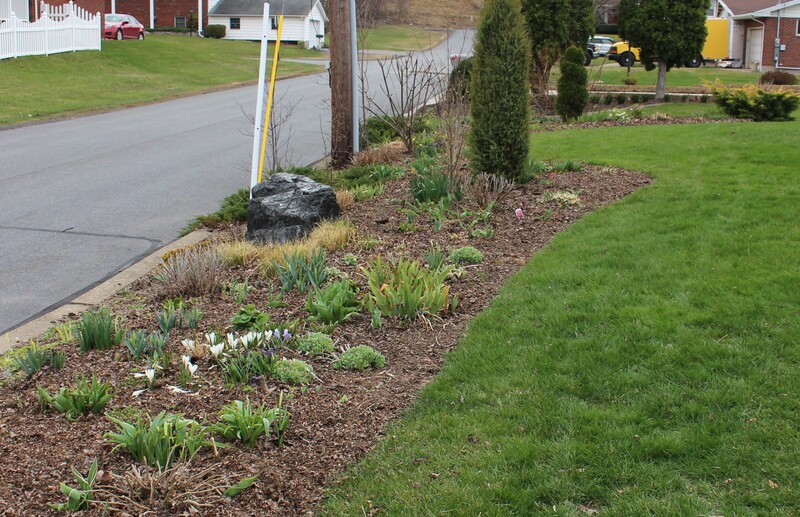 A nice mulch of shredded leaves will do wonders smothering the weeds this summer and feeding the soil all spring. I wish I had more! Daffodil ‘Tweety Bird’, a product of Brent and Becky Heath’s breeding program, filling in where I pulled out an invasive burning bush last fall. One, and possibly the only, thing good about frequent cold spells is that some of the daffodils are showing their deepest, glamour shot colors without the fading which normally occurs in the warmer weather. Here in a cool bed which is shaded by a fence, ‘Jetfire’ is looking almost fluorescent with its orange cup. I’ve never seen it this bright before, and hopefully this is a good start for this bed since I’m still into the months long process of killing the most persistent weeds here with a double shot of thick mulch and weed killing spray. Maybe by the start of this summer I can finally refill this open land with all kinds of new goodies! 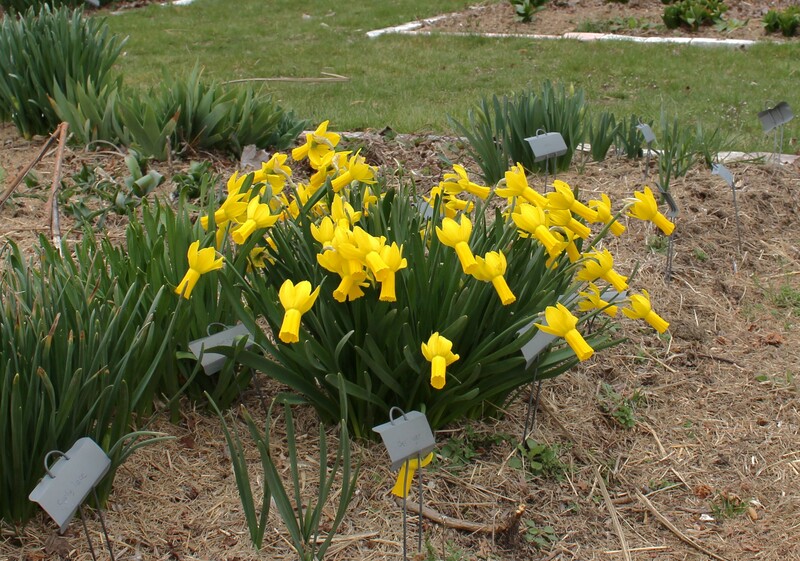 Another thing you may or may not know is that I tend to have a lot of favorite daffodils, and that’s because I grow a good assortment to choose from, and I challenge anyone to stick to just one favorite! 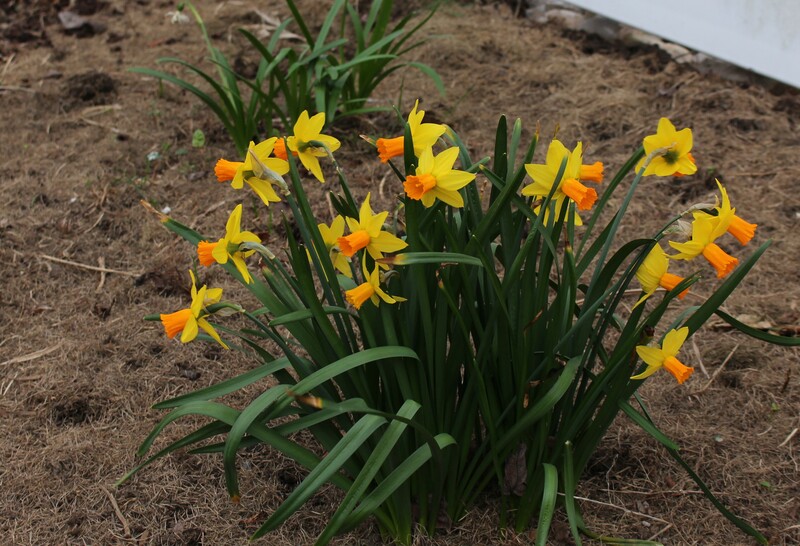 Narcissus ‘Rapture’ is an award winning, American bred daffodil with just the kind of cyclamineus genes I love. Look at those cute little reflexed petals and long trumpet! 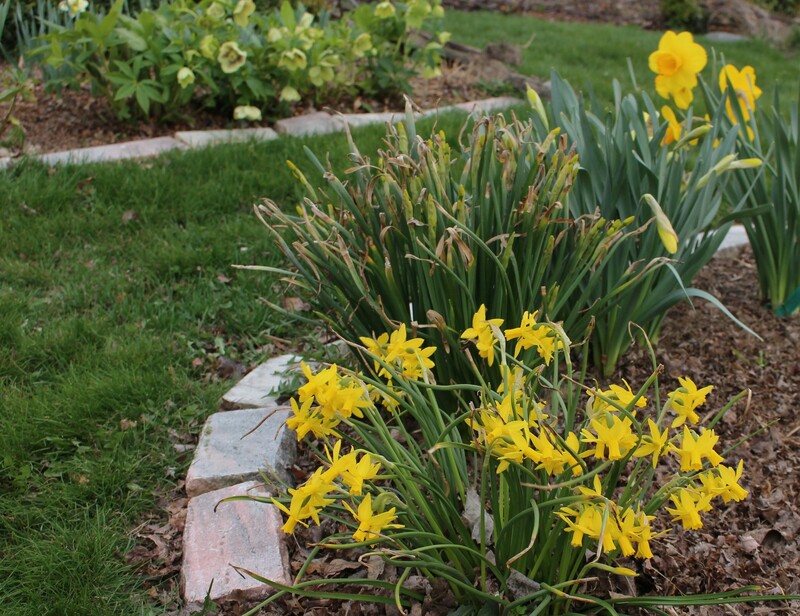 As you can see by the neighboring empty spots, not all daffodils have done as well in this location, since at one time this bed was fully planted. A nice fat clump of Narcissus ‘Rapture’. If I didn’t already have so much yellow out front I’d surely spread this one around the mixed border along the street. But of course the up and down weather is even beginning to wear on the daffodils. Arctic blasts of cold burnt the early tips of many of the more trusting varieties. 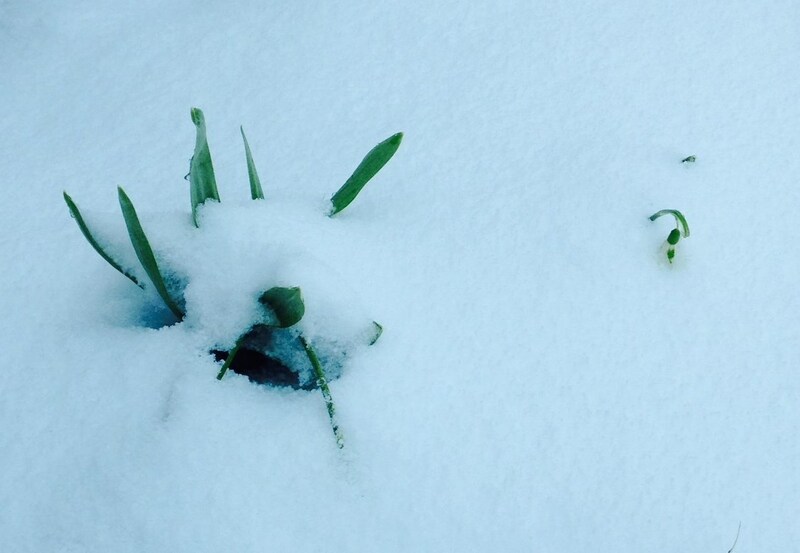 The jonquil types of daffodil sprout just a little too early for our zone. This is probably ‘Pipit’ or ‘Hillstar’ and even in a good year the tips of the foliage get singed by too cold weather extremes. 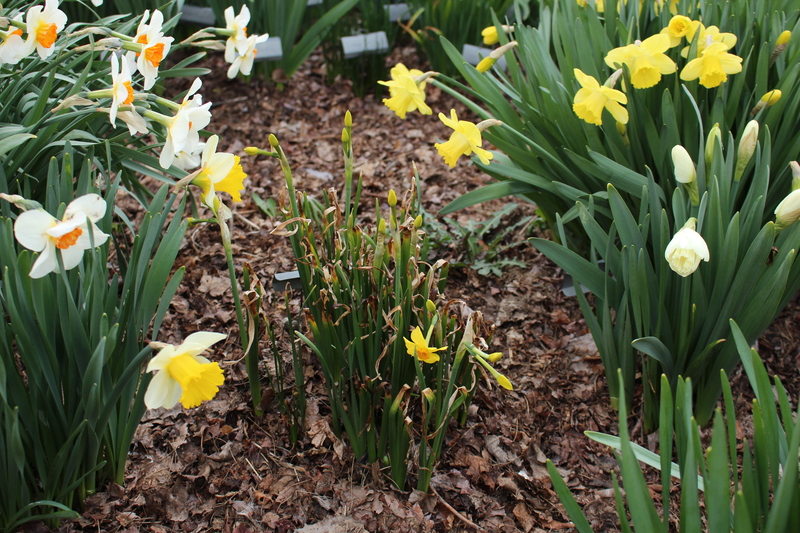 It’s all or nothing for some of these daffodils which carry the genes of the more southern N. jonquilla. If it’s a cold winter they hunker down and don’t poke up their heads until the weather has settled, but in an unsettled winter they keep on trying to get started during every warm spell. Narcissus ‘Tiny Bubbles’ with a freeze damaged ‘Kokopelli’ behind it. I like the dainty flowers on ‘Tiny Bubbles’ but I wish either the foliage was shorter or the blooms up a little higher. 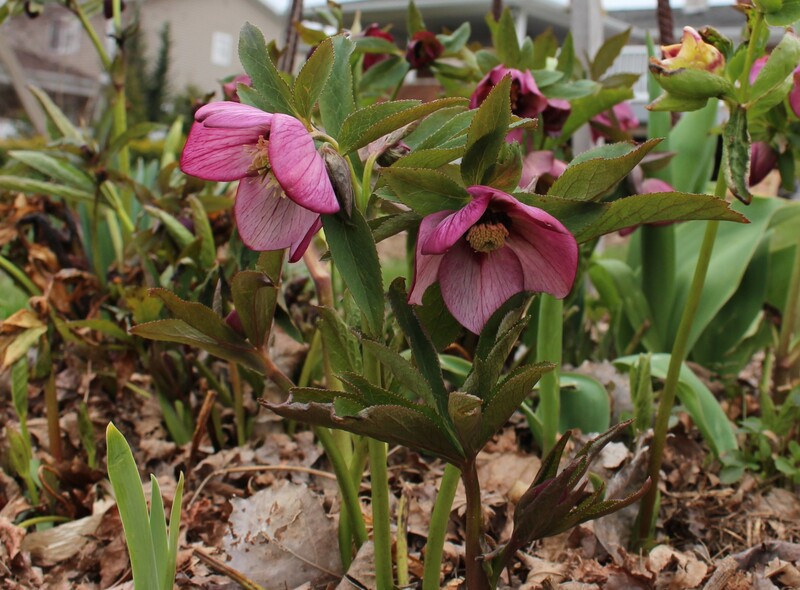 The unsettled winter crushed this year’s hellebore show. I should have seen that coming since last fall they looked better than ever and were poised to bloom their heads off. So much for that. Here’s one which managed to come out and open perfectly between the frigid blasts of cold. There are singed and damaged flowers all around but this one with its dark centers and perfectly veined blooms is enough to make me smile. 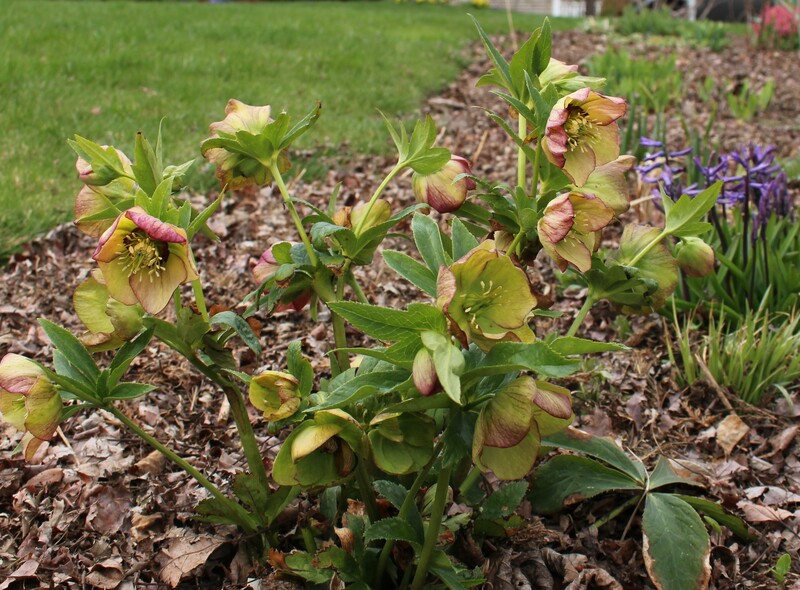 Of course I have my favorites among the hellebores as well. 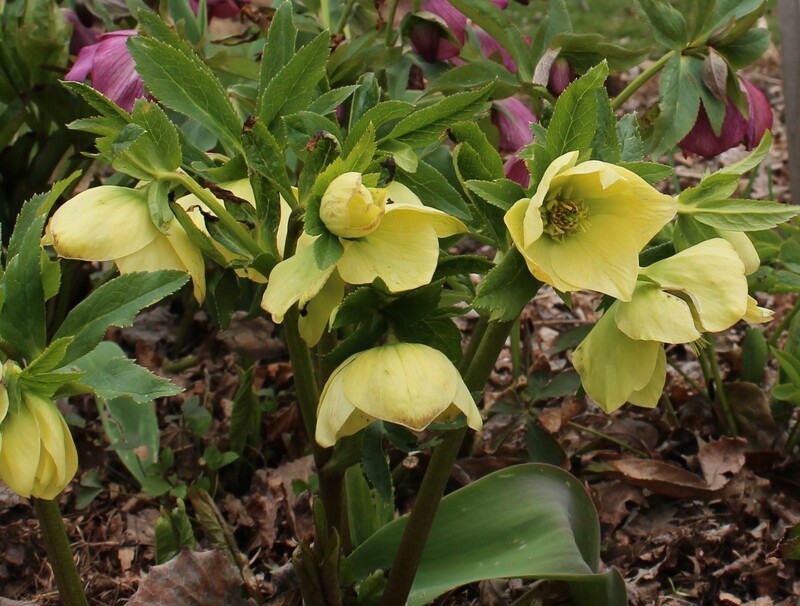 Would you call this a yellow picotee hellebore? I like the red shading and subtle color, but suspect it might not jump out at everyone. I guess it’s time for a reality check. Here are the daffodils this morning as the cold wind howls outside. 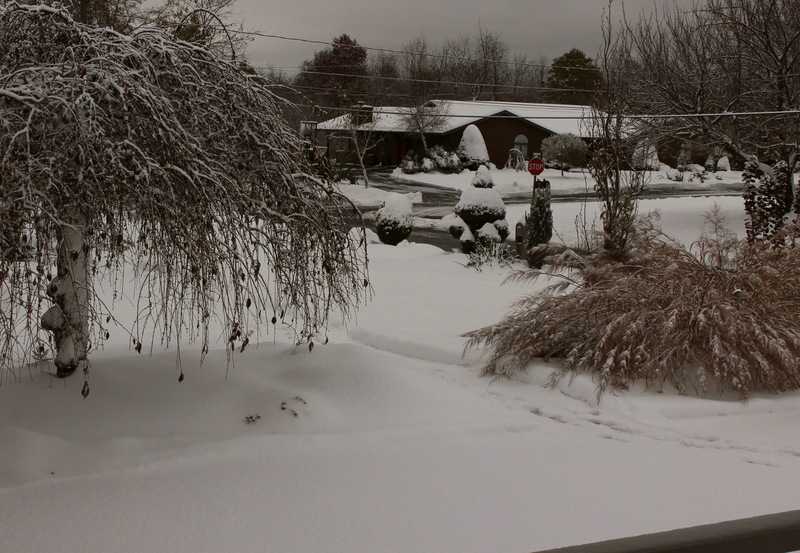 The front foundation border once again covered in snow. To be honest I hope the snow predicted for tonight also comes through. The garden can use a little bit of extra cover to help it out when the low temperatures drop to 19F (-7C) for both Monday and Tuesday. Whatever. All the early bulbs flattened and frozen by a late cold snap. You can bet my fingers are crossed they make it through this…. It’s normal for everything to wilt as it freezes, and that’s a good thing since too much water in the stems will cause them to burst as the water expands, but I’m not sure exactly what else will survive the upcoming deep freeze. I’m writing off the wisteria, even the barely expanded buds will most likely die off, and the hyacinths will be mush, but I’m most worried about the tulips and daffodils. A few years ago a one night cold snap permanently ‘did in’ a bunch of tulips, this longer spell has me more worried, and I have many more now than I did back then. C’est la vie. 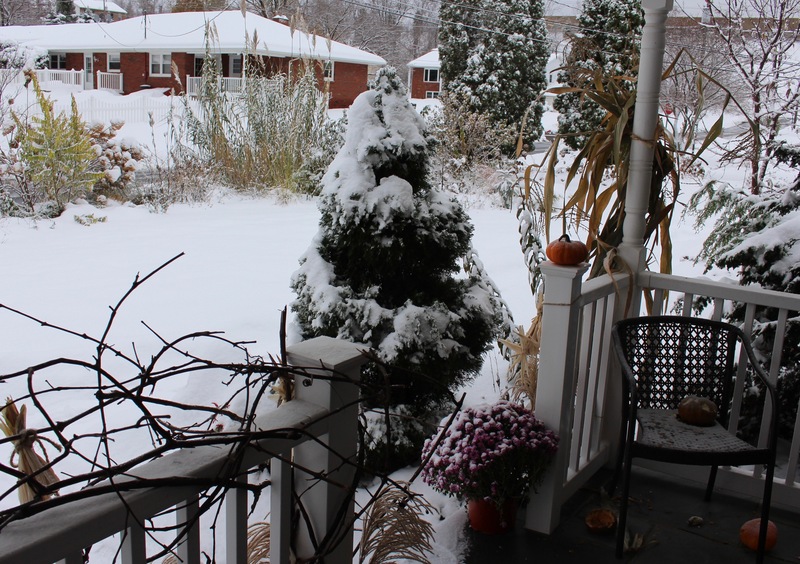 Maybe I’ll order a few new cannas today, and dream of a beautiful June garden. April and May are kind of iffy right now, but as long as the birds sing and the sun is warm we’ll be fine…. tulips or not. How’s this for spring color? 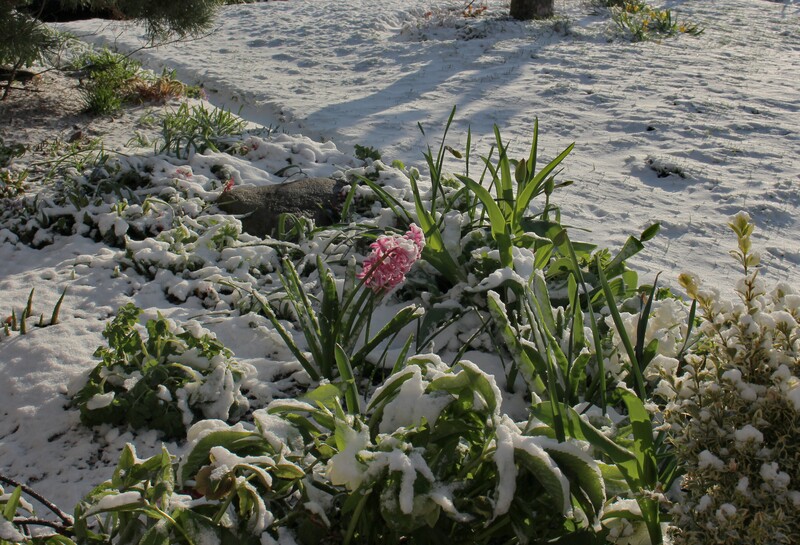 Good thing I got my new snowdrops planted Saturday. By Sunday night a storm system moved up the coast and by Monday morning we were again covered by a couple inches of snow. Winter is really putting up a fight but March sunshine works wonders, and by late afternoon the snow had melted back enough to convince the bunny buffet to open up and invite spring back. The wind and sharp temperature plunges may have been a little too much for some of the snowdrops, but most just laugh off a late season snow. This bunch is just as happy today as they were last week. Today the thermometer made it up to almost 60F (15C). 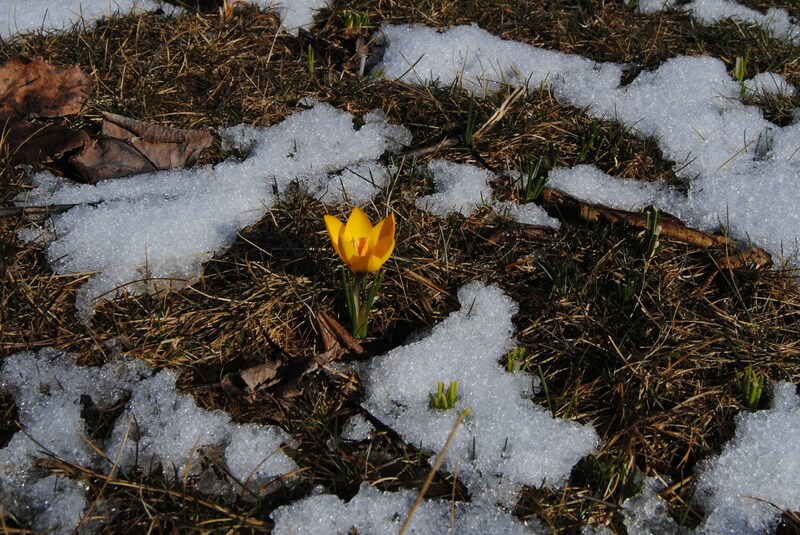 Flowers were opening, snow was melting, and I saw the first honeybees working what few crocus were left in the meadow. Spring weather for sure and even if the yard is a soggy mess from all the rain and snow, the birds and flowers don’t care, they’re ready to go!